Sketchy Science: The World’s Most Useful Table. Period. 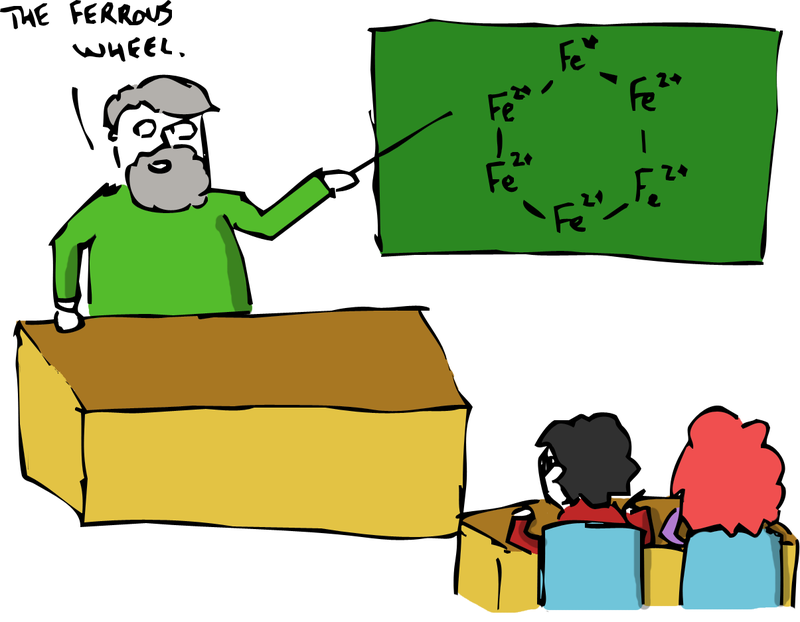 On the first day of my first chemistry class in grade 11 my teacher opened the lecture by assuring the group of 15 and 16 year olds that sat worriedly in front of him that chemistry was nothing to be feared. Rather than thinking about the subject as an incomprehensible branch of science, beyond the grasp of the average person he told us that chemistry was a language. The language of the universe, in fact. Chemistry is what we use to describe the things around us in a way people from all corners of the world can understand. The frightening chemical formulas that lay before us like C­­2H4O2 (vinegar) were words in this new language that we would be studying and at the heart of this language was a unique alphabet: the periodic table of elements. The periodic table is one of those scientific concepts that is so useful and understandable that most people can pick it out of a line-up by name and give you a rough understanding of what it does. At it’s heart, it is a list of all the known elements in the universe. An element is the most basic form of matter. It is useful to think of elements as simple, irreducible atoms. Each element has it’s own atom that is different from all the rest. If you take piece of gold, for example, and cut it in half and in half again over and over until all you have is a single atom of the stuff you are free to cut it in half again, but whatever you want to call the result, it isn’t gold anymore. Likewise, not every material can be called an element. If you look at a molecule of vinegar (presumably by squinting very hard) you will see it is actually many atoms of carbon, hydrogen, and oxygen stuck together. Since it doesn’t have a specific atom, it isn’t an element. The periodic table though is so much more than a list of atoms. It tells us about the way those atoms behave and how they interact with one another. You just have to know how to read it. The periodic table is useful because of the periodic law, discovered in 1911 by Henry Moseley. Moseley took the existing period table (assembled in 1869 by Dmitry Mendeleyev) and attempted to fix some of it’s problems. The thing about the original periodic table was that it presented elements based on their atomic weight (the weight of their atoms) at the same time that it grouped them into columns based on similar traits. The trouble was that in order to maintain the groups occasionally elements had to be presented out of order with respect to weight. 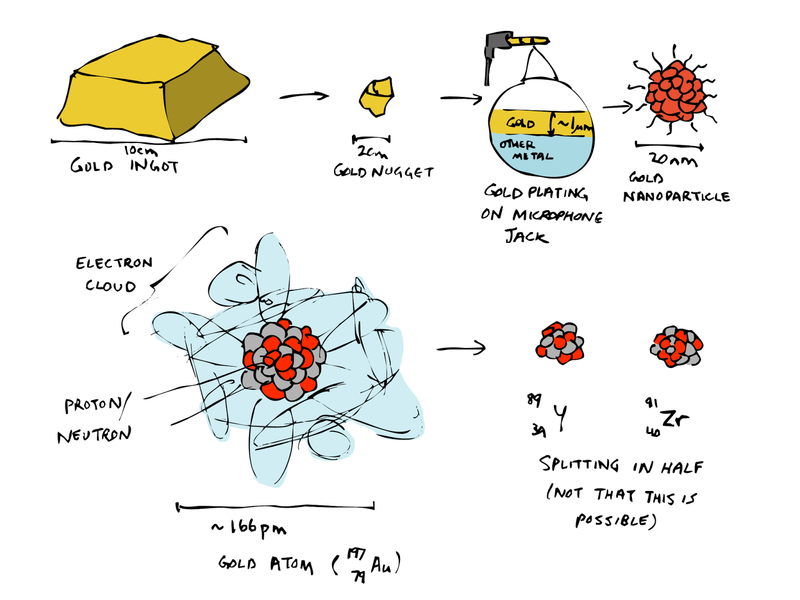 Moseley used X-rays to figure out that if you sorted the elements based on the number of protons or electrons their atoms contained (their atomic number), all the problems went away and you had neat and tidy groups. The columns of the periodic table describe these groups (more or less). A few elements don’t satisfy all the criteria of their groups, but are included because of how they react with other elements. A good example is hydrogen which is in the column describing alkali metals despite not being anything resembling a metal. The rows of the table tell you about the reactivity of the elements included. Generally speaking, as you move left to right on the periodic table elements get less reactive. The alkali metals on the far left (and hydrogen) are the rambunctious toddlers of the family, closely followed by the alkaline earth metals in the second column. These elements are so eager to play with others that the results can be explosive, as anyone who has ever dropped a piece of raw sodium into a glass of water can attest to. Elements on the far right are the older, more solitary fellows called (appropriately) the noble gases. They know better than to go off causing explosions so they are unreactive, which explains why we fill balloons with helium (a noble gas) and not hydrogen. The cool thing about the periodic table is that it is also predictive. Since the elements are sorted by the number of protons or electrons their atoms have, occasionally there are gaps. If you know about 2 elements and one has an atomic number of 12 and the other 14, you can be 100% positive that there is one out there with an atomic number of 13 that you just haven’t discovered yet. In practice, the gaps on the periodic table exist at its highest numbers and the undiscovered elements are all radioactive and don’t exist in nature for more than a fraction of a second at a time. 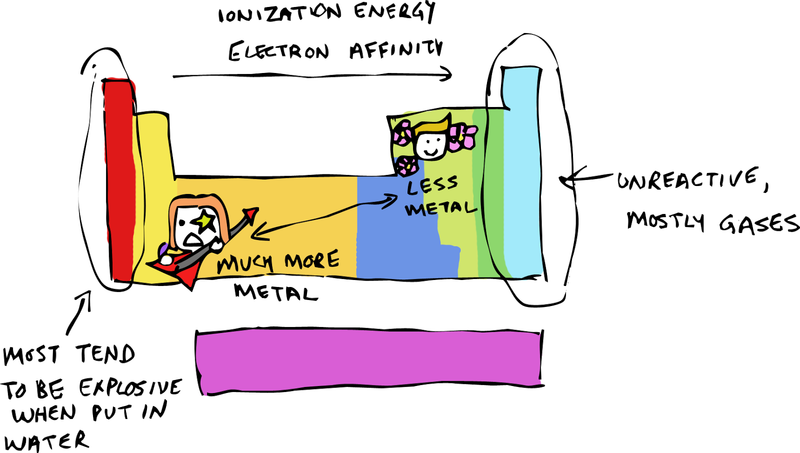 Scientists discover them in particle accelerators and if the International Union of Pure and Applied Chemistry agrees that they have found a new one, they get to name it after a place, scientist, mineral or based on one of its traits. 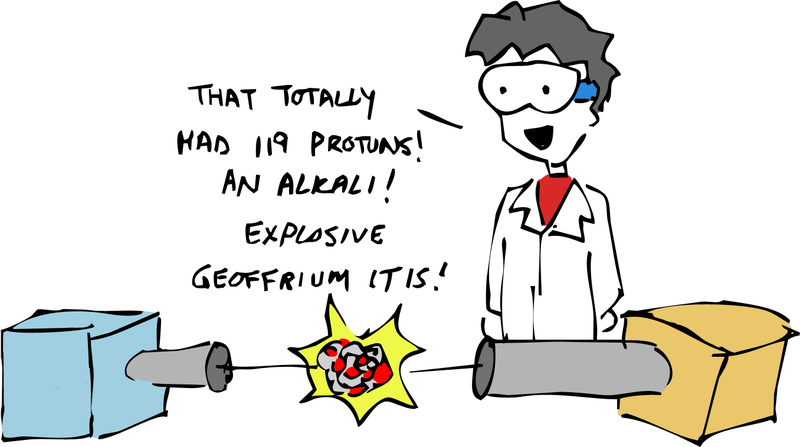 That is why we have elements with fun names like Einsteinium (atomic number 99). So there you have it. 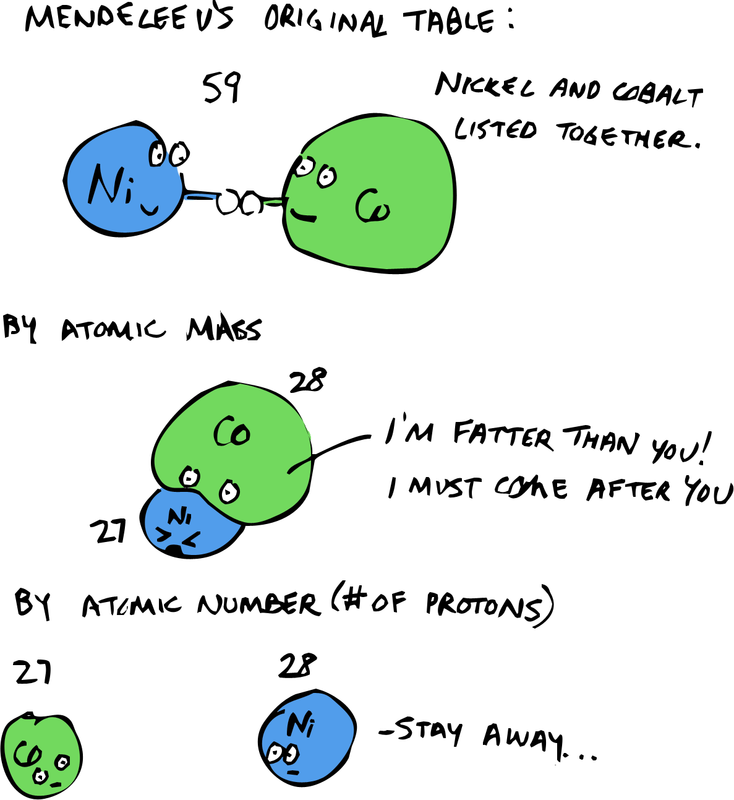 A quick and dirty introduction to the periodic table. From this easy and accessible alphabet humans have built atomic bombs, air ships, and shiny necklaces. It doesn’t look half bad on a T shirt, either.